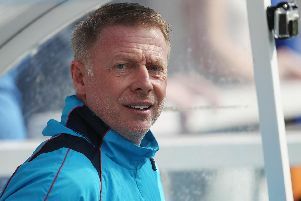 Nicky Deverdics today called on his Hartlepool United team-mates to turn draws into wins. Deverdics scored a fine free-kick early in the second half to open the scoring in last night’s game against Tranmere Rovers, but Jay McEveley’s header secured a point for the visitors six minutes later. The result means that Pools have only lost once in 12 games, but they have let winning positions slip in their last two encounters. The National League table remains wide open – Pools are only eight points behind new leaders Dover Athletic and three off the play-offs – and Deverdics wants more wins on the board. “It keeps the unbeaten run going,” was the Geordie’s assessment of the 1-1 draw. “But we’ve all said in the changing room after the game that we need to start picking up three points. “One point, one point, one point isn’t going to get us anywhere. “We have taken two points from six and we need to start picking up wins if we want to be in the play-offs. “It’s a long season, but we need to cement our place. The 29-year-old believed that Pools were worthy of three points up until Tranmere scored. “I think we played the better stuff for 60 minutes, but then their goal is a sucker punch,” he commented. “They then had a very good chance at the end to nick it. Reflecting on his great strike – his second successful free-kick in 10 days after his effort against South Shields in the FA Cup – he said that he only made the decision to shoot at the last moment. “[Nicky] Featherstone made a run down the right – they were setting up their wall and didn’t spot him,” he recalled. “The ref said ‘wait for the whistle’, so I said to Nicky that I couldn’t give it to him. “It was a similar distance to the South Shields one. I thought with the conditions, even if I hit the target and the keeper parries it, the lads might have a chance.